The new year often gives people a refreshed perspective on life: on the future, on current habits, on how they want to change for the better. It's not unusual to make a few New Year's resolutions (it's also not unusual to break them). In an effort to help you become the best version of you possible, Apple has set up a special section in the iOS App Store highlighting some terrific apps to help get you started. Most of them you already know, but it's never bad to revisit some old apps filling up the dead space on your iPhone's third or fourth homescreen. The categories highlighted include Fitness Focus, Healthy Eating, Personal Finance, and more. I'm particularly drawn to the Work Smarter section, which includes Clear, Evernote and IFTTT—all apps I've been reminding myself to try out. There are some other notable inclusions, such as Mint in the Personal Finance section, and Lost It! in Healthy Eating. Some of the apps are free, while others are range from a few bucks to a ten spot. Some of the apps in Apple's list are available for Android, but by and large iOS users have the healthier selection. Instead of just highlighting one app in particular, I thought it would be appropriate to help readers get a head start on their New Year's resolutions. Want to get in shape? Try out Zombies, Run! or even Pocket Yoga. Or give Mint or Level Money a whirl if your goal this year is to better manage your finances (a constant battle of mine). Twelve apps are highlighted in each category, so you have quite a few to sift through. It's never easy forming new habits (or breaking them), so let the quality and convenience of some mobile apps help you out. You might actually find yourself keeping your resolutions for once. 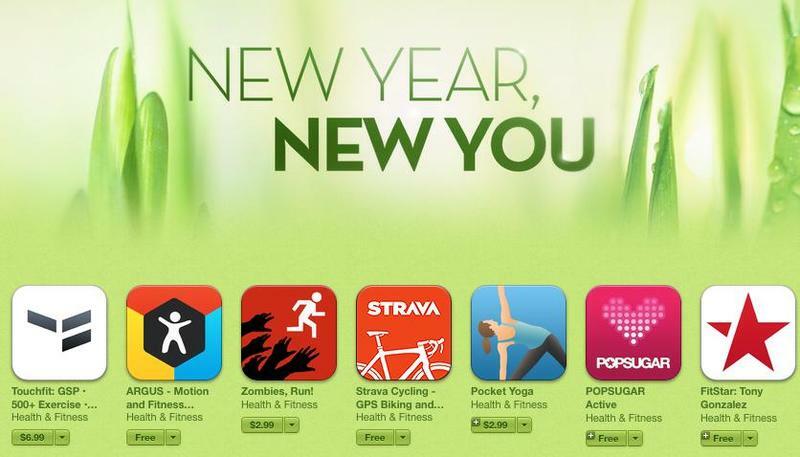 You can check out the app store right now to sift through Apple's "New Year, New You" section.